During March’s Professional Women’s Alliance leaders from Sonora Quest Labs shared insight into how emotional intelligence leads to success. Christina Noble’s first job performance review at NASA’s Jet Propulsion Laboratory came back with lower scores than she anticipated. Seeing her disappointment, her boss advised her to internalize her frustration, leaving her emotions at the door. Noble, now senior vice president for business development at Sonora Quest Laboratories, took that guidance to heart. She set aside her emotions for years until she determined how she could harness those reactions to aid in her success. 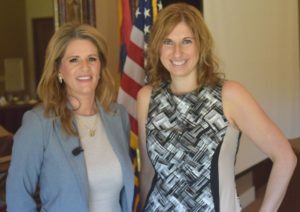 During a two-part presentation during March’s Professional Women’s Alliance luncheon, Noble and a colleague provided attendees with insight into how emotional intelligence can lead organizations to success. Emotional intelligence is the ability to manage your emotions and the emotions of others. This skill plays a key role in leading an organization to success. Noble cited the book Emotional Intelligence 2.0 by Travis Bradberry and Jean Greaves during the presentation, which says emotional intelligence is the single biggest predictor of high-quality performance in the work place. During the second part of the presentation, Veronica Owens, human resources business partner at Sonora Quest Laboratories, discussed the monetary benefits of making emotional intelligence a priority in an organization. While Owens acknowledged emotional intelligence isn’t the only factor in the company’s growth, she believes it kick-started the company’s renewed path to success. Overall, Noble and Owens provided the following strategies to help lead companies to success. Companies seeking to grow should provide opportunities to employees to grow their emotional intelligence. At a time where market demand is ever-changing, companies must learn how to respond quickly to beat the competition. Transformational leaders who possess emotional intelligence to lead companies during times of change are much more likely to lead companies to success. “We have to adapt a new way of thinking about emotions in order to become better leaders,” Noble said. To see pictures from March’s Professional Women’s Alliance featuring Christina Noble click here. The next Professional Women’s Alliance luncheon will be on Tuesday, April 11 featuring Tanya Wheeless, founder of wellness start-up Happy Grace. Wheeless will share proven tools that go deeper than simple time management to achieve greater balance in work and life. Register today! -Written by Alexie Chavez, marketing coordinator Greater Phoenix Chamber of Commerce.